One of several benefits to joining the Farm Direct Coop is the opportunity to experience a wide variety of local fruits and vegetables. When I first joined the coop three years ago, I never ate turnips, had never even heard of Hakurei Turnips for that matter! Fast forward to today and it’s one of many new favorites I look forward to each Spring. As you prepare your first bounty of the season, here’s a quick take on what to do with those lovely white turnips. Clean and chop greens, minus stems. 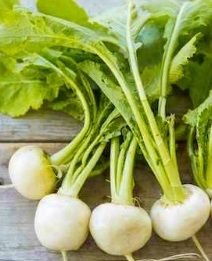 Cut top and bottom of turnips off, then slice up the rest of the turnips as thick or thin as you prefer. I like mine with some ultra thin slice mixed in with some bigger chunks. In a saucepan, heat olive oil just until warm. Add seeds and nuts, if using. Toast gently. Add remaining wet ingredients and whisk to combine. Warm through and reduce to desired thickness. Remove from heat and toss with salad. Greens should wilt gently, bringing out the flavors and creating a unified salad. Top with croutons, if using, and enjoy immediately. *Note* If your dressing is boiling vigorously, let cool for one minute before tossing with salad. This entry was posted in Recipes and tagged arugula, hakurei turnips, lettuce, salad, wilted greens by Jennifer Moore. Bookmark the permalink.